In many ways, Margherita is having a year of Job. Her mother is dying and she and her brother spend much of their time with their parent in the hospital. She’s directing a socially conscience film that is not going well; it seems fake and she’s not sure she can make the project work, and small things keep going wrong. She has recently broken up with her latest lover because she can’t leave her work at home. She is having trouble relating to her daughter. And she is having difficulty getting a performance from the American actor flown in for the lead of the film (he has a condition that makes it difficult for him to remember lines, made worse in that they are in Italian). The film, Mia Madre, is co-written by the director Nanni Moretti (along with Valia Santelli and Francesco Piccolo) and is inspired by the time in his life when his mother was dying while he was filming We Have a Pope. It’s an emotionally palpable and often moving film that switches from reality to dreams and magical realism, at time not immediately letting the audience know what is real and what isn’t. Margherita follows a line outside a movie theater and runs into the people in her life, as well as her younger self. She wakes up one night to find her apartment flooded, unable to soak up the water. The director is played by Margherita Buy, a role especially written for her. 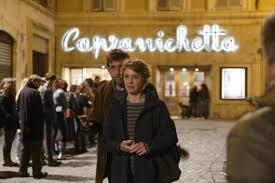 She and Moretti, who plays the brother, give warm, understated and empathetic performances. Nothing is forced, every emotion is subtly rendered. John Turturro plays the American actor Barry Huggins (I’m not sure one can get a more American name than that). He plays the role with a manic bravura, swinging from overdone flattery to extreme frustration (he has one priceless scene where he has to drive a car with a windshield blocked by cameras, while manipulating a stick shift, delivering lines not in his native language-he reportedly had to do very little acting here). The movie in the dream scene is Wings of Desire, the great German film from Wim Wenders about angels assigned to help mortals, but finding it a frustrating and difficult task. Winner of the Ecumenical Prize at the 2015 Cannes film festival. The Light Between Oceans, the new, what at one time was called a, weepy by writer/director Derek Cianfrance (he also wrote and directed Blue Valentine and directed The Place Beyond the Pines) is, quite possibly, one of the loopiest films I’ve seen in some time. I guess I’m being kind. My best friend in Chicago thought it ludicrous. The story revolves around one Tom Sherburne (Michael Fassbender), a WWI vet who takes a job as a lighthouse keeper off the coast of Australia because he wants solitude. He soon marries a local woman, Isabel Graysmark (Alicia Vikander), and their relationship seems almost Edenic. But when they try to have children, Isabel twice miscarries, the second time without the two telling anyone. Then one day they find a boat adrift. In it is a dead man and a live baby just old enough that it could be theirs. So they bury the body and raise the child as their own. But when the truth comes out, by way of something Tom does, Tom is arrested for murdering the man. Will his wife support him or let him be imprisoned for life or executed for murder? And what will Hannah Roennfeldt (Rachel Weisz), the real mother of the child, do? Very little of the plot is convincing, especially the idea that Tom would be accused of murder (this part is greatly under dramatized). And the pacing is a bit stately. 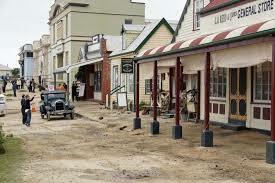 It is a rapturously beautiful film, lingering lovely as it does on the scenery of Tasmania. The period costuming and sets are rendered in convincing detail. And the three main actors do a rather good job of bringing their characters to life. But it’s still a pretty loopy film. With Bryan Brown as Hannah’s father.